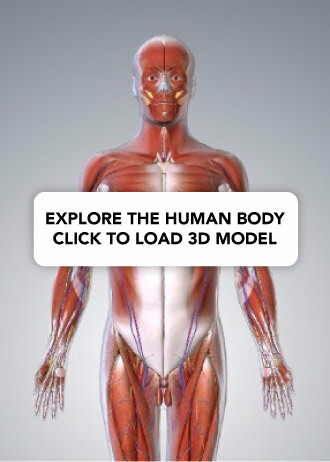 The cardiovascular system is one of the first body systems to appear within the embryo. It is active by the beginning of the fourth week – when the placenta is unable to meet the requirements of the growing embryo. In this article, we shall consider the embryonic development of the heart and cardiovascular system, as well as some important clinical conditions associated with failure of this process. The development of the heart begins with the formation of the primitive heart tube following the folding of the embryo during the end of the third week. Firstly, lateral folding creates the heart tube by bringing together two precursor regions, then cephalocaudal folding positions the heart tube in the future thorax. Initially, the heart tube is suspended within the pericardial cavity by a membrane; this subsequently degenerates to allow for further growth. The heart tube continues to elongate, and begins looping at around day 23 of development. The bulbus cordis moves ventrally, caudally, and to the right (forward, down and right), and the caudal portion – the primitive ventricle – moves dorsally, cranially and to the left (backwards, up and left). This process produces a shape that is much closer to the fully developed heart. Fig 1 – The process of heart tube looping. At the fourth week, the sinus venosus is responsible for the inflow of blood to the primitive heart, and empties into the primitive atrium. It receives venous blood from the right and left sinus horns. Over time, the venous return shifts to the right side of the heart, causing the left sinus horn to recede and form the coronary sinus (responsible for the drainage of venous blood from the heart itself). The enlarged right sinus horn is absorbed by the growing right atrium and eventually forms part of the inferior vena cava in the adult. In the left atrium, a similar process occurs with the pulmonary veins. The four pulmonary veins are incorporated into the left atrium, forming the smooth inflow portion of the left atrium and the oblique pericardial sinus. The early arterial system begins as a bilaterally symmetrical system of arched vessels, which then undergo extensive remodeling to create the major arteries that exit the heart. 1st arch Contributes to the maxillary, hyoid and stapedial arteries. 2nd arch Contributes to the maxillary, hyoid and stapedial arteries. 3rd arch Forms the common carotid artery and part of the proximal internal carotid artery. 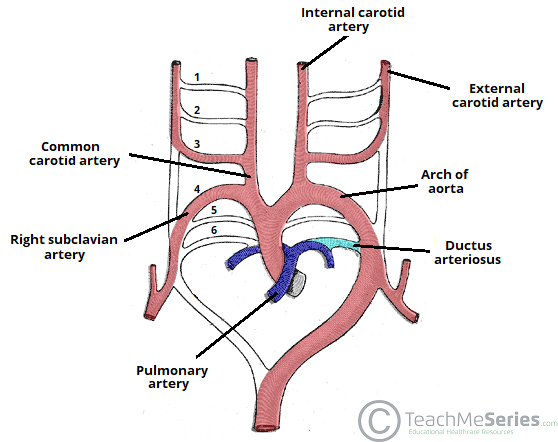 Left arch forms the left pulmonary artery and the ductus arteriosus. Right recurrent laryngeal nerve – initially hooks around the right 6th aortic arch. However, when the distal part of the right 6th arch disappears, it moves up to hook around the right subclavian artery (4th arch). Left recurrent laryngeal nerve – hooks around the left 6th aortic arch. The distal part of the left 6th aortic arch persists as the ductus arteriosum, and so the nerve remains in this position. The long course of the left recurrent laryngeal nerve is clinically relevant, as it is susceptible to pathology in the chest (e.g. compression by an aortic aneurysm). Fig 2 – The aortic arches and their major derivatives. Septation of the heart into right and left channels occurs first, when endocardial cushions developing in the atrioventricular region expand to divide the heart. The septation of the primitive atrium involves the formation of two septa and three ‘holes’. Firstly, the septum primum forms and extends down towards the fused endocardial cushions to split the atrium into two. The ostium primum is a hole present before the septum primum completes fusion with endocardial cushions. Before the ostrium primum is closed a second hole, the ostium secundum, appears within the septum primum. Following this a second septum, the septum secundum, grows with a hole known as the foramen ovale present. The presence of both the ostium secundum and foramen ovale allows a right to left shunt to be present in the developing heart. The timing of this process is carefully controlled. At all times, at least one hole is present in the septa to allow communication between the left and right atria. This allows blood to be shunted to the left side of the heart, bypassing the non-functional lungs. Fig 3 – Septation of the atria and ventricles. The interventricular septum of the ventricles has two components; one muscular and one membranous. The muscular portion forms much of the septum and grows up from the floor of the ventricles towards the fused endocardial cushions, but a small gap, the primary interventricular foramen, remains. This gap is filled by the membranous portion of the interventricular septum, which is comprised of connective tissue derived from endocardial cushions. Endocardial cushions also appear within the truncus arteriosus which grow towards each other. As they grow towards each other they twist around each other and form a spiral septum, dividing the outflow tract into left and right sides. In the fetal circulation, vascular shunts are required to bypass the liver and non-functioning lungs. The lungs are bypassed by two separate shunts, firstly the foramen ovale between the two atria, which is responsible for bypassing the majority of the circulation. Any blood that does not pass through the foramen ovale enters the pulmonary trunk, which is linked to the distal arch of aorta by the ductus arteriosus. These two separate shunts allow the circulation to bypass the lungs. The oxygenated blood entering the fetus also needs to bypass the primitive liver, this ensures that enough oxygen reaches the developing brain. This is achieved by passage through the ductus venosus, which is estimated to shunt around 30% of umbilical blood directly to the inferior vena cava. Foramen ovale – intake of air leads causes pulmonary resistance to fall. The pressure within the left atrium is now higher than the right. As blood cannot flow through the foramen ovale left to right, this effectively closes the shunt. It fuses shut in most individuals by the age of 1 year. 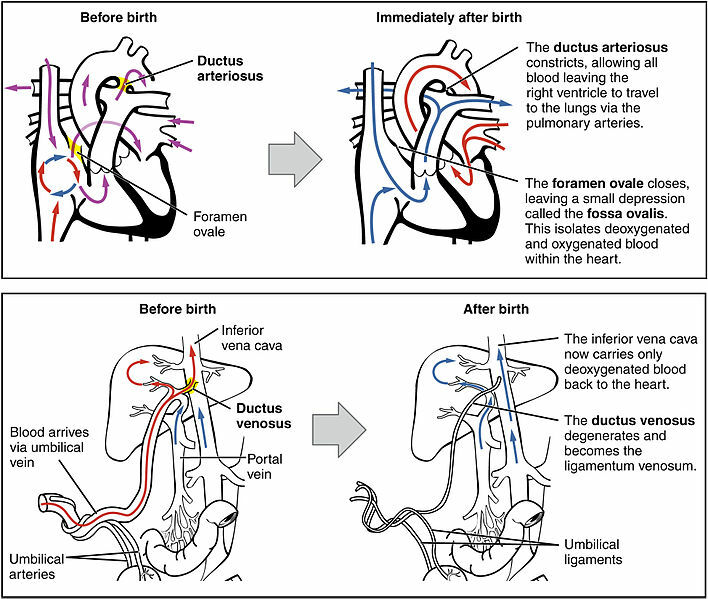 Ductus arteriosus – muscular wall contracts to close after birth (a process mediated by bradykinin). It is the most common cyanotic congenital heart defect and is often diagnosed prenatally using echocardiography. Treatment takes the form of surgery during the first year of life, in which the pulmonary valve can be widened and the ventricular septal defect repaired. If the condition is not treated, Tetralogy of Fallot results in progressive worsening of the right ventricular hypertrophy, eventually leading to heart failure. Which of the following defects is NOT present in Tetralogy of Fallot? Foramen ovale is a structure which forms in which part of the heart?